Amazon needs no introduction, guys. You know I usually like to do a little song and dance about the brand that I’m reviewing just to, you know, give a little context and background about what is going on with the brand that created the product. But this is Amazon’s OWN Rely protein brand. I know. Right? We aren’t talking about some indie wellness brand anymore. We’re talking about the king. The one. The most important company of our generation. Maybe ever to be. It’s crazy, right? But I’ll save the profound commentary for a rainy day. Let’s start with the top question that was absolutely burning into my mind- does Amazon Revly Protein TASTE good? What is the Best Flavor of Amazon Revly Protein? So real quick- I bought two flavors of the Revly Grass Fed-Whey protein. To my knowledge, they only make the two flavors. They are, as you could have guessed, chocolate and vanilla. These are the two most common flavors to launch with, so I’m not surprised that Amazon went with the popular duo. Let me describe each flavor and then tell you a little bit about which is my favorite Revly flavor. Chocolate: The chocolate Revly is really about what I expected. I know- you’re thinking could I POSSIBLY know what to expect from Amazon Revly protein. But I’ll get to that in a second. I knew that Revly’s chocolate flavor would be quite heavy on the milk chocolate and not be terribly intense as for dark chocolate notes. I knew they would play it more down the middle. (That’s a common theme with Rely as you’ll see). Don’t get me wrong- this Revly flavor is very easy-drinking, it’s just not that remarkable. I personally like a really bold chocolate flavor. One that hits me hard with bitter cocoa. That is unfortunately NOT what Revly does. So. This is not the one for me. Vanilla: I sort of expected the Revly vanilla flavor to be more of a standard / classic ‘French’ vanilla, however I was mistaken. This one had a much more modern sort of vanilla bean flavor, which was to my liking. I did find the flavor to be far from intense enough despite the fact that I did enjoy what little flavor was there. I thought the sweetness could have been ramped up in both flavors as well. As for texture, both proteins had a bit of a ‘longer grain’ than you would expect from most modern protein powders. That’s because Revly is grass-fed. So don’t forget the grass-fed texture is always a bit different. As for which is better- I would have to say that the best flavor of Revly protein is the vanilla. Both are not bold enough, but the chocolate is particularly weak. There are much better protein powder options when it comes to taste. But. Let’s see. What else… Why don’t we move into the ingredients and look under the hood at what’s actually in Amazon Revly protein. 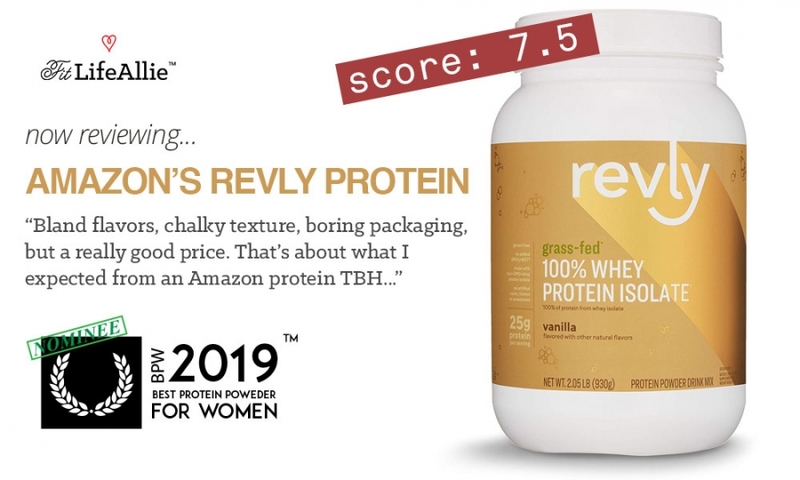 What’s in Amazon Revly Protein? Glad you asked- because I have the answer. In this protein powder, you have, well, not all that many ingredients. I was expecting a FEW more flavor/texture ingredients from Amazon, but then again also not because keep in mind, this is an economics-first brand. Amazon wanted to make something with HIGH margins. Meaning, for those of you who studied gender equality for 4 years, that they want to make the most MONEY as possible. So basically the way you or I would have made it if we were Amazon. We know we’re going to sell the crap out of it no matter what by giving it all the prime real estate on the site, so, why not maximize those profits and line Jeff Bezos’ pockets. After all. He needs to get some of it back that he lost to his wife after he cheated on her. Oh my. Sorry guys. Lol. The real me is coming out tonight in this Revly review! Whew! Yeehaw! Lol. Don’t hate me. NOTES: Again, I’m really surprised (but not) that Amazon didn’t add MORE to this Revly protein to make it taste a little better, or a little smoother, or a little SOMETHING. Anything to give the taste some character. But yeah. It’s not a terrible formula at all. Similar to the ingredients section of the review, there is not a whole lot going on here as far as the packaging. I don’t understand the name ‘Revly’ to begin with…that part is strange. The focal point of the label is the extra-large ‘Revly’ logo that sits along the top 1/4 of the label. It is neither a positive nor negative design element. It just is. The product description and extra info are positioned smartly lower just below. At about $33 for 30 servings, the Revly protein is priced to sell. As we expected, it is priced quite a bit lower per serving than it’s competitors.